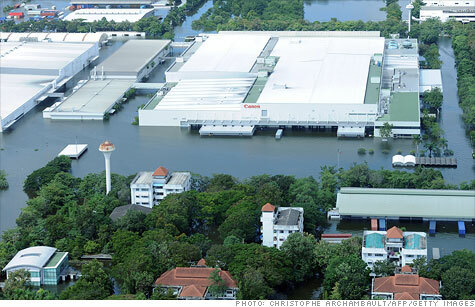 The Canon factory north of Bangkok is just one of hundreds of manufacturing facilities impacted by the floods in Thailand. NEW YORK (CNNMoney) -- Just when the electronics industry had finally recovered from Japan's massive earthquake earlier this year, devastating flooding in Thailand has once again stymied production of several key consumer electronics components. Thailand serves as an electronics manufacturing hub for hundreds of companies, particularly for those based in Japan. Suffering its worst flooding in decades, Thai production of hard drives, cameras and microchips has come to a standstill. The disruption is sending shockwaves through the industry, and it is expected to impact the availability of other devices like laptops and set-top boxes. Irvine, Calif.-based Western Digital (WDC, Fortune 500), the global hard drive leader, is expected to be among the hardest hit companies operating in the region. The company has two of its main manufacturing facilities in Thailand, and flood waters entered both facilities, submerging much of the company's equipment in one location. Production at both facilities has been suspended since Oct. 12. With greater exposure to the flooded areas than its competition, Western Digital will likely lose its top spot in the hard drive market this quarter. It will probably get bumped down as far as third place, according to an IHS iSuppli forecast released Monday. "This is a disaster of unprecedented scale," John Coyne, Western Digital's CEO said on a conference call with analysts two weeks ago. "The flooding in Thailand presents us with a series of daunting challenges during the next several quarters." Shares of Western Digital have fallen 9% since it suspended production in Thailand, and the company said it may not be able to meet customer demand for its products this quarter -- even as overall hard drive demand is expected to flat-line. The hard drives that are made by Western Digital, Toshiba, and other smaller players in the areas impacted by the flooding are mainly designed for notebook and netbook personal computers. Since PC sales have slumped this year, laptop vendors have ample supply of hard drives that can last through the quarter. But the impacted companies have said that production will likely be disrupted for at least six months. As a result, IHS iSuppli said there could be a shortage of notebooks in the first quarter of 2012. Any shortage would be short-lived, however. By March, vendors will most likely have worked out solutions to the hard drive shortage, including using hard drives from different companies made in different regions or even switching to Flash memory like that used in Apple's (AAPL, Fortune 500) MacBook Air laptops. In addition to hard drives, Thailand is home to the manufacturing operations of several camera companies, including Canon (CAJ), Nikon and Sony (SNE). Production at all three companies' facilities have either been suspended or severely disrupted due to the flood. On a conference call with analysts last week, Toshizo Tanaka, Canon's chief financial officer, said the company expects to make 100,000 fewer full-sized cameras and 1 million fewer compact cameras this year due to the floods. Overall camera shipments will likely fall over the next six months as a result, IHS iSuppli predicts. American semiconductor suppliers On Semiconductor and Microsemi have been significantly impacted by the flooding, and Rohm and Toshiba have also taken a hit to their chip production. Though Japanese customers could be impacted by this, the global impact will likely be negligible. Consumer electronics manufacturers aren't the only ones to face production delays due to the Thailand floods. Automakers Toyota (TM), Ford (F, Fortune 500), Nissan, Honda (HMC), Mitsubishi and others have also halted production in the country, as facilities have been exposed to the rising waters. As a result, IHS iSuppli anticipates a production loss of between 130,000 and 205,000 cars and small trucks from the companies that manufacture automobiles in the country.